An online conman who sold fake City & Guilds and OCR certificates from his Darlington cul-de-sac home has been sentenced 80 hours of unpaid work. Edexcel, AQA and Ofqual logos were also used by Martin Bowman as he produced the counterfeit paperwork. However, Darlington Magistrates’ Court heard that most of his customers asked for refunds because the certificates were of such poor quality. The 26-year-old, who has moved to Gosforth since the crimes, was sentenced at Darlington Magistrates’ Court on Wednesday (January 14) to 80 hours of unpaid work and ordered to pay costs of £567.97, including a £60 victim surcharge. He had, at an earlier hearing, admitted two counts of selling goods with a sign which was likely to be mistaken for a registered trademark. Andrew Swan, defending, said there was a statement on the website that the certificates were for novelty use. Alison Lewis, AQA’s director of quality and customer standards, said: “Selling or using fake certificates is unacceptable. 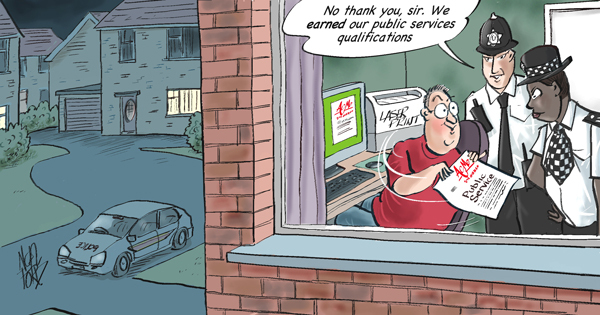 Students work hard to gain their qualifications and we want them to feel secure that their certificates will be highly valued by universities and employers.